TomTom's upgrades have made the Spark a better device over the past year in terms of functionality; the weakness is the smartphone app which could be a little more engaging and more stable and should really replace the needed PC link. Waking early in the city offers plenty of unique advantages to the urban runner. It's a chance to run as the local population is wiping the sleep from its eyes, going about the routine of preparing for the day, heading to work, heading home from nights out, setting up market stalls and opening shops. A waking city is something to experience, offering a different perspective. And for those who travel, that early morning run makes it feel as though you actually went somewhere and did something. With the TomTom Spark 3 sports watch, which is focused on running, cycling and swimming activity, that's now so much easier. TomTom has stuck to a single design formula for a couple of iterations of its sports devices. In the Spark, the body is one piece that fits into a rubber strap. On the Spark 3 this is a new strap that's softer and a little more comfortable to wear, but not a huge change from the previous version. If you want to buy new straps that's easy enough as TomTom offers loads of options for around £20-30. Yes, the old Spark fits into the new straps too, if that's what you're thinking. The design sees a 22 x 25mm display sitting on top of the body, with a curved tongue offering a four-way controller for easy navigation of the menus and screens. There's no touchscreen to fiddle with and the controller is distinct, so you know you've pressed it, making controls nice and simple. The downside of this design is that to charge the watch you have to remove the strap and connect it to the bespoke charger which clips onto the bottom of the tongue; the upside to this equation is that the charger attaches securely, so there's no worry that a magnetic charger didn't connect properly. The Spark 3 is identical to the older devices, so there's nothing to tell them apart and the interface is simple, hierarchical and monotone as it was before. In fact, there's been little change since the TomTom Runner launched in 2013, and even the new Adventurer repeats this design, so things are getting a little samey. There are no customisations on offer and although TomTom offers 24/7 activity tracking - allowing you to set targets for steps or distance for example, and sleep tracking - this is strictly a sports watch, with no leaning towards other connected options, like smartphone notifications. The Spark leverages TomTom's experience in GPS for route tracking. The addition and the biggest change in the Spark 3 over previous versions is better support for routes: whereas previously GPS was used to record your location for you to view via TomTom MySports, the Spark 3 now lets you track routes in real-time on the watch itself. The idea is to allow you figure out where you are, where you've been, and let you get back to where you started. Route exploration is one of the joys of running and the Spark 3 allows you turn right instead of left and figure out through the trace where you have to get back to. This isn't about mapping: unlike the Garmin Epix, which will show you topographical maps, the TomTom presents a simple traced line that, thanks to the new onboard compass, you'll be able to find your way back to. In practice it's more useful than it might sound. If heading out in a strange location you don't have to worry about looking at a map or remembering every point of interest - and you're not restricted to out and back routes, because it's fairly easily to run more randomly and return to the start location. When running, all you have to do it head into the heart-rate stats and press up to see the trace. This offers two views: one that's a larger view showing kilometres; the other a zoomed-in view to a few hundred metres. Generally, you can glance at the larger view to get back to somewhere you've been previously, then switch to the closer view to zoom back in and get on the same path again. The simplicity of the display makes it ideal for running, as it's all about glancing and confirming without breaking stride. The other side of this ability to draw routes is about planning where you're going to run. You can save trails you've run previously as routes so you can repeat them, or, and perhaps more exciting, is the ability to upload GPX files to add new trails. This is a little more advanced, for those who know where they are going and what route they want to run, but it does mean that you can get a route that a friend has run, or download a route from the internet to put onto your watch. Adding a GPX route to your Spark 3 will mean connecting the watch to a PC and using the TomTom MySports Connect app to open up the browser to sync to the device. You can rename routes to make them more memorable to you, and then find them in the "trails" section of the menu. When you go to start a run, you simply have to head down and select that trail, so you can follow the path you took before - again with two views; the overview and the 100m view within easy access. One of the things we've liked about previous iterations of the Spark is the accuracy of things like the heart-rate sensor. There are now many devices that will monitor your pulse, but many are inconsistent, inaccurate and frequently drop out and give you extraneous results. The TomTom Spark 3 is solid in its delivery of heart-rate monitoring and offers a range of different stats on the run, like heart-rate zone so you can easily see what you're doing relative to personal capacity, what the training effect of that is and how it can fit into your fitness plan. This keen HR tracking is also paired with good GPS results. We've found this to be consistent with other devices, like our usual Garmin Forerunner, so the distance is pretty well recorded, for example. The recording of the route can be a little off, although in the grander scheme of things, the distance is pretty close to the actual route distance, even if the trace line that you view sees you weaving across roads, into rivers or cutting corners. We suspect this comes down to the frequency with which the Spark records the GPS position - which is not uncommon for GPS devices. However, the Spark 3 can be a little sluggish to pickup a GPS location at times. To help solve this, connection to the MySports app on your smartphone will transfer over QuickGPSfix data. This can be a little varied in performance, especially when travelling. We've arrived somewhere new, connected to the app and been good to go. On return, we've sometimes found ourselves waiting for a really long time for the location to be found - even after syncing with the app. One of the downsides is that in the normal running mode you can't even start running without a GPS fix. The treadmill option will allow you, if you can't be bothered to wait. The best advice (and we've had to do this with other devices too) is to get your watch looking at the sky well in advance, so you don't have that delay when you're standing there ready to run. There's no option for a footpod which might add accuracy in such circumstances, but there is support for a cadence sensor and chest strap heart-rate monitor, which gives better support for cyclists who might want to mount the Spark 3 on their handlebars. The high contrast display of data means it's easy to glance at your Spark 3 and see how you're going, with plenty of screens to scroll through using the four-way controller to get to the stats that you want. For those running in the dark, there's also illumination so you can see what's going on. The TomTom Spark doesn't automatically identify your sports, which some smartwatch devices will attempt to do, but we're happy with this. If you want to swim or cycle, you select those options and the stats you're given are tailored to your view. There's no open water swimming options, though, instead the Spark 3 relies on lengths, with you manually entering the size of the pool. Although there's support for a range of activity types, there's no combined multisport option, so it's no good for tracking your triathlon, unless you want to constantly stop and start the watch, which you'll forget to do when you're whipping off a wetsuit and putting on your bike helmet at pace. This is a criticism we've had of the Spark range since the beginning, but as auto-detection isn't possible we can see why this feature still lacks. We've found the battery life to be good for about three or four runs before you'll want to charge. Of course that's dependent on lots of factors, like whether you play music, how far you runs are and for how long, and if you're using it all the time for tracking or just for specific sport. TomTom's official figures say five hours of HR, GPS and music; 11 hours of GPS capture; or several weeks of activity wear. No device is complete today without an app and with any sportswatch you want a method of examining and compiling your data. Whether you're a beginner wanting to track your weekly distance gains, or an advanced runner wanting to see how your heart responded when you started those hill repeats, stats are for champions. To get started is a bit of a fiddle, as you'll be invited to register the Spark by connecting to your computer. You can ignore that, if you want, but for the best results you'll need to connect up and sign into your TomTom MySports account. It's here you'll get software updates and more functions, so the Spark 3 is still very much a device that needs to be connected by wire at some point in its life. This MySports account is the same as you'll sign into on the app too, with the same data being presented across both. The advantage of using the connection to your PC is that it's solid: you plug in the cable and it works, whereas the connection to your phone can be a little temperamental, losing the connection and asking you to pair the device again, which is frustrating. The PC interface which sits in the browser will also let you add GPX routes as we've mentioned, as well as save your runs as routes for the future, which the smartphone app doesn't. So the app is a little way behind, but at least it will sync to the Spark 3 so you can easily view your latest runs on the move without needing the PC link. What's really missing from both is any sort of training programme. If you're targeting a 10km or half-marathon, it would be great to have access to training programmes to simply and easily use the Spark to guide you and monitor your weekly build-up and taper for effective training. Sadly, you'd have to manually manage this process, although the Spark does have a number of races available, as well as the ability to set distance or time goals to guide the run you're about to head out on. The app will at least let you nominate connections to various other tracking platforms, so you can share your efforts with NikePlus, Strava, Endomondo, MapMyFitness, MyFitnessPal, TrainingPeaks and others. There's no Fitbit on that list, but you can sync Fitbit with MyFitnessPal to get your data through. We've been using the TomTom Spark 3 Cardio + Music. This is TomTom's top device and the complete package, as you get the Bluetooth headset in the box (more on that in a minute). It also commands a lofty £249 price point, which sounds a little high, but it does offer a wide range of features. Here's how the TomTom Spark 3 models break down. All models offer GPS tracking, 24/7 activity tracking, different sport tracking and the new route trace feature. TomTom Spark 3 Cardio + Headphones - £249 - heart-rate monitor, Bluetooth sports headphones, 500 songs storage. 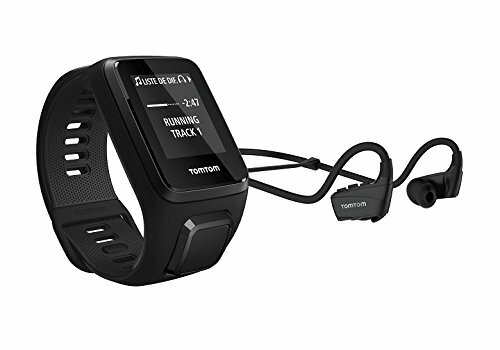 TomTom Spark 3 Cardio + Music - £199 - heart-rate monitor, 500 songs storage. TomTom Spark 3 Cardio - £169 - heart-rate monitor. TomTom Spark 3 Music + Headphones - £149 - Bluetooth sport headphones, 500 song storage. TomTom Spark 3 - £119 - no heart-rate monitor, no music, no headphones. That's a huge range of prices and the core GPS tracking and new route tracking features are available to all, meaning you can buy the device that fits your needs. Bundled in some of these Spark packages are TomTom's own headphones. Designed for sport, these headphones fit into your ears, looping over the tops of your ears and connecting around the back of your head. There's a rubber strap that you can add and slide for a secure fit. We found the fit to be really comfortable and with a selection of different tips in the box, getting a secure fit is pretty easy. They are lightweight and water resistant so well designed for the job. There are controls on the right-hand earpiece that cover a range of functions, like power, play/pause, volume and track skipping. Pairing with the Spark is easy enough - you simply move up from the clock face to search. The quality of playback is good too. There's enough volume and we achieved a sufficiently good fit to provide a degree of isolation, too, for a good bass delivery, which is otherwise often lacking because you can't get a secure fit when running. The Bluetooth connection was pretty good too, although there was the occasional blip owed to a momentary loss of contact. One of the slight downsides is that you can't get music onto the watch unless you use your computer. You can't just collect a bunch of files from your phone and move them over, it has to be a playlist from your computer. That playlist can just be an album and it can be automated, but we'd really like to be able to manage things from a phone. At the £119 starting point, you can't really go wrong with the TomTom Spark 3. Although the functions are a little basic, you get a device that's better than most at this price, with good GPS tracking. Further up the range the combination of music and heart-rate monitoring is good, but we'd baulk at the TomTom Spark 3 Cardio + Headphones £249 price if the Bluetooth headphones weren't as good as we found them to be. At that price though, there are a lot more rivals - from Garmin to Polar, even Android Wear pretenders and the Apple Watch - although few offer the combination of phone-free music, heart-rate monitoring and GPS with the same kind of battery life. That makes the TomTom Spark 3 a device that's worth considering for someone wanting a running or general sports companion. Garmin's rival devices might be a little more engaging, with the use of colour and some more advanced functions, but they are also pretty expensive by comparison. The same can be said of Polar: there's a little more excitement in places, but again at a higher price point. TomTom's upgrades have made the Spark 3 a better device over the past model in terms of functionality; its weakness is the smartphone app which could be a little more engaging, more stable and should really replace the required wired device-to-PC link.